The recent election underscores the importance of properly creating and managing your Corporate Image - the foundation of most brands. Whether you are an organization or an individual, the sooner you realize that you have a corporate image that has to be properly developed and managed, the better off you will be. It is one of two essential building blocks of branding and, in turn, one of the seven building blocks of marketing. Positioning is the other. If you don't establish the right corporate image, you will not have a strong foundation upon which you can build and sustain a successful business or career. Corporate Image is simply the image of the creator of your products. That could be you, your company, or any group within your organization. If you are having trouble with understanding that a group within your organization may have a corporate image, a few examples are in order. Lockheed Martin's Advanced Development Programs is called the Skunk Works. It has an image of creating radical innovation within the organization. Boeing has a similar group known as Phantom Works. Groups within the US Military also have corporate images. The one that many have heard of is Seal Team Six. Why is your Corporate Image critical to your success? It governs the way the rest of the world thinks about you. The right image creates a bond of trust between you and the marketplace, enables you to achieve your goals, and boost your earnings. The wrong one can block attainment of your goals and deplete your bank account. If you don't create the image you want for yourself or your company, the marketplace will create one for you. Since many in the marketplace (especially competitors) have their own agenda, it is unlikely they will brand you with a corporate image that is as favorable as the one you would create for yourself. By beating them to the punch, you plant your desired corporate image in buyer brains before your detractors can. What does creating the right Corporate Image do for you? Human brains are designed to protect us from harm. To be available for emergencies, our brains like to relax and take shortcuts to process most information. If you create the right corporate image, your constituents will be comfortable doing business with you without thinking much about it. For example, if Coca Cola is your preferred soft drink brand, you do not have to waste any time deciding what soft drink to buy before putting it in your shopping cart. You have a trusting relationship with the brand that allows you to buy without thinking about your purchase decision. As a result, you save time and energy, and that leads to saving money. Companies or individuals that create a corporate image that saves you time, energy, and money are more likely to win your business. How do you create a Corporate Image? Creating an effective corporate image involves the following steps. Mission Statement. Create a mission statement that makes it clear (1) What your company does, (2) Who the target audience is, and (3) What makes your company unique. Corporate Identity tools. Create corporate identity tools that include (1) Name, (2) Logo, (3) Slogan, (4) Colors, (5) Type fonts, (6) Mascots, and (7) Jingles. Training. Train your employees and other internal stakeholders on your mission and corporate identity tools so they can transmit them via their word-of-mouth pyramids and social media circles. Promotion. Promote your mission and corporate identity tools to people outside your company using traditional, online, and social media. You put them on business cards, letterhead, signs, company vehicles, packaging, brochures, and all corporate communications. Measuring results. Using your marketing information system, you need to measure how effectively your corporate image is working. Corrective action. Using the same system, you need to make necessary adjustments to the above if they are not working according to plan. Rumor Procedure. If what others say is not true, you should employ the following three steps of the rumor procedure (1) Don't publicize the rumor, (2) Promote the opposite of what the rumor says without mentioning the rumor, and (3) Provide undeniable and verifiable proof to support (2). Fact Procedure. If you did something wrong, you should employ the following fact procedure (1) Admit and apologize, (2) Limit the scope (or put the mistake in perspective), and (3) Propose a solution so the mistake is unlikely to reoccur. Negatives into positives procedure. On a transactional basis, misunderstandings and other negative situations will occur between you, your company, and your target audience. You need to do what you can to turn these into positives to (1) neutralize the negative before it turns into a conflagration that does serious damage to your image and (2) develop a closer relationship with the person (or people) that feel "wronged" by your company. If you turn on the news at any given time, you can find numerous examples of organizations mishandling their corporate images. Trump and Clinton in the recent Presidential Election. The numerous studies on Corporate Image point to the same result. Companies that create a good image and protect it using the procedures outlined above achieve higher levels of success. The results of three pioneering studies are summarized below. Marriott Study. In their book, Turned On, Roger Dow and Susan Cook describe the Marriott research done to identify which guests intended to stay at the Marriott again. They divided guest stays into 3 groups (A, B, C). Group A = Nothing bad happened during their stay; Group B= Something bad happened, but Marriott fixed the problem; Group C = Something bad happened, but Marriott did not fix the problem. The percentage of these three groups that intended to return to the Marriott were as follows: Group A = 89%; Group B = 94%; Group C = 69%. Notice the largest group that returned was the B group where the negative was turned into a positive. TARP Studies. John Goodman did pioneering customer service research through TARP, the company he founded in 1971. He showed that, while customer service is typically a cost center in most companies, it could be turned into a powerful marketing force to drive sales, repeat business and greater profits. His research showed that roughly 4% of customers (1 out of 26) that were "wronged" by a company complain. The other 96% (25 out of 26) stop buying and tell 9 to 10 others within a week about their poor treatment. 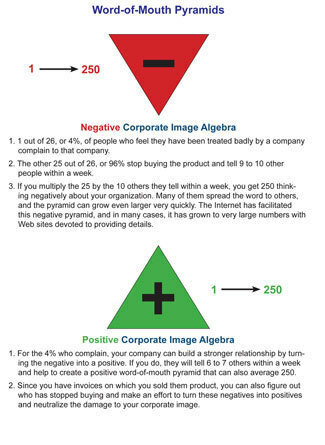 This means that a negative word of mouth pyramid averaging 250 is created. If the company is able to satisfactorily solve the problems of the 4% that complain (turn the negative into a positive), they will tell 6 to 7 others within a week that the company solved their problem. Opinion Research Studies. Opinion Research did studies that showed that when choosing between similar products, 87% of customers choose the product from the company with the better reputation. Another study showed that companies that develop a good reputation by taking good care of their customers are 25 to 85% more profitable! Once you take steps to create and protect your Corporate Image, you can benefit greatly by implementing measures to leverage the positives. Enhancing your image basically involves communicating your successes to the widest possible audience. You excerpt testimonials, awards, and other accolades in your marketing materials, on your Web site, in social media, and in visible physical (and virtual) spaces around your business. When your various publics come in contact with this information, it will make a positive brand impression that is likely to cause them to buy what you are selling and tell people they know through their networks. In this way, you can leverage your corporate image to increase your business and make positive impressions on customers, prospects, future employees, vendors, and all your constituents. Most important of all, a good corporate image will provide a solid foundation on which you can build a successful business and career. I wish you the best of luck.